The epic struggle between good and evil continues and now you must take a side. The Star Wars trading card game lets you and a friend engage in full-scale battles. 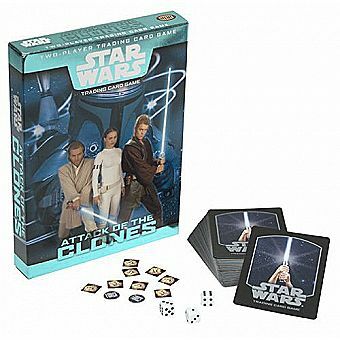 Based on Episode II, Attack of the Clones, this expansion set includes two ready-to-play decks. One deck puts disciples at your bidding as you embrace the power of the Sith Lords, or choose to align yourself with the Jedi Knights and use the Force for a higher purpose with the other deck. This game is for beginners who want to learn the game, play quickly, and build decks. It combines cards and dice with your strategies. Play it and determine your own destiny. "The Star Wars Two-Player Trading Card Game is for beginners who want to learn the game, play quickly, and build decks. It combines cards and dice with your strategies."